Monster number 2 is all Liz Lovick’s fault. 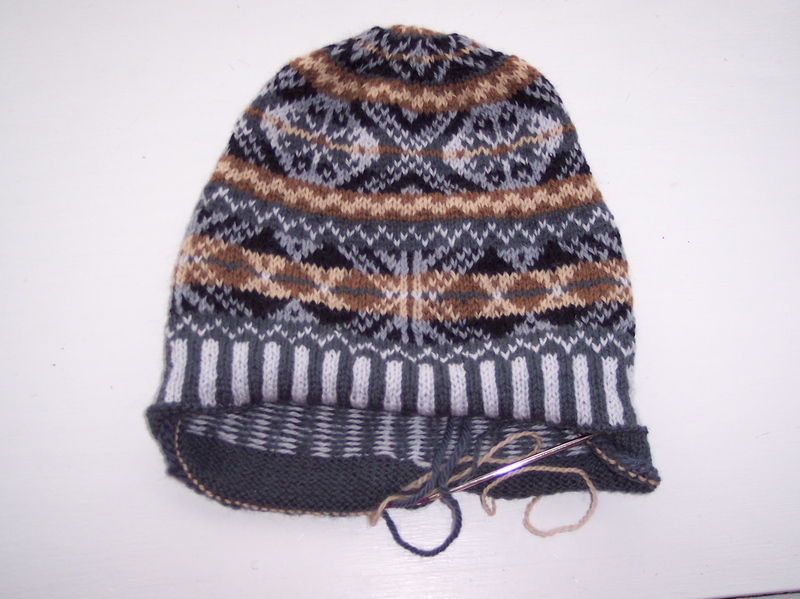 Liz is a knitter who lives on the Shetland Island of Orkney and who is an expert on Shetland knitting, from lace to fishermen’s sweaters to stranded color work, including Fair Isle knitting. 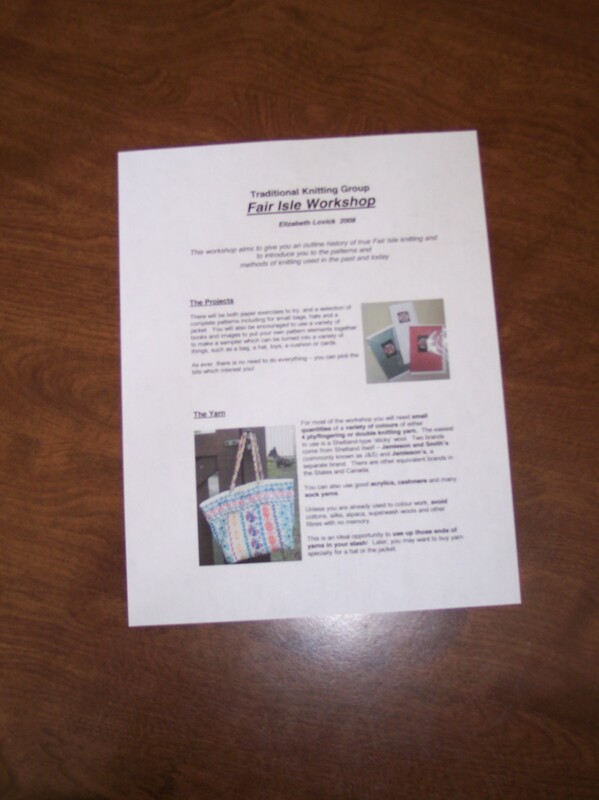 She is very generous about sharing her expertise with the knitting community and has produce a number of wonderful workshops that she offers on her web site for a small price. And they are worth every penny. 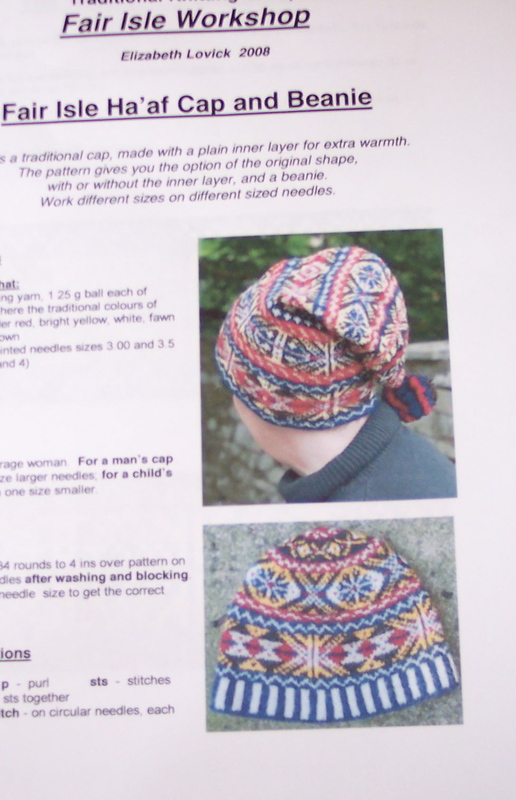 Liz is a member of the EZasPi Yahoo group and has recently offered her Fair Isle Workshop to its members. I’ve always wanted to do Fair Isle but was intimidated by it, so I jumped at the chance to do this workshop. As readers of my pervious entries know, as a result of Liz’s wonderful instructions, I produced a beautiful Fair Isle beanie using Liz’s pattern and a color combination I borrowed from Madeline Weston’s book Country Weekend Knits. Here’s my version of the beanie. You can compare it to the picture above from the workshop and to the sweater that inspired my color choices. Isn’t it amazing how different the beanie looks with the different colors? Here’s my beanie while I was sewing the hem. Here’s my beanie turned inside out. See how neat the hem looks after the live stitches have been sewn down and the beanie has been dressed? My confidence has soared, and I feel I’m almost ready to pursue my dream of knitting a Fair Isle sweater. 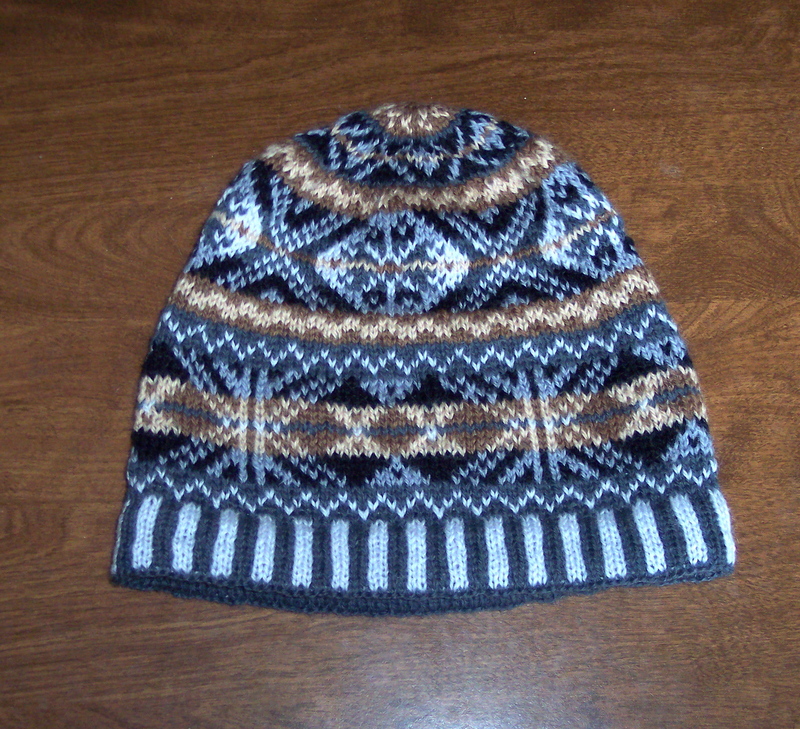 But before I embark upon such a large and costly project, I decided to do at least one more beanie. 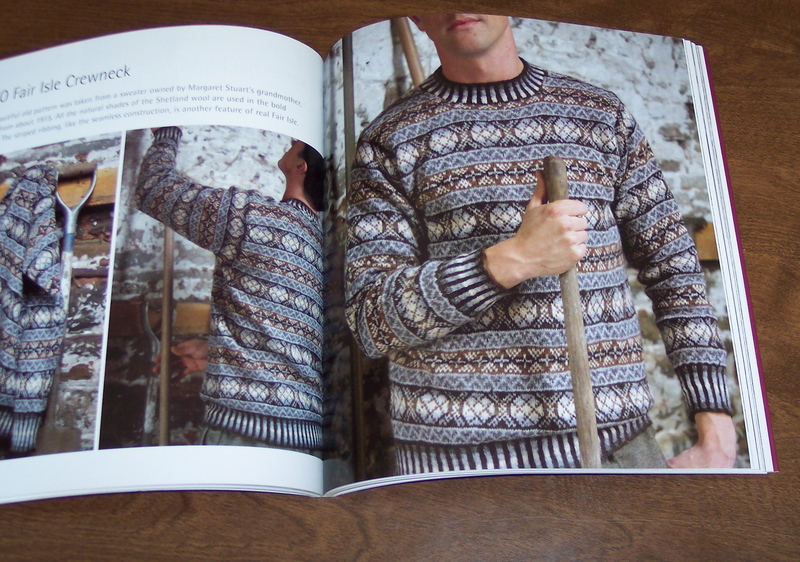 I found a pattern I really like in Ann Feitelson’s book The Art of Fair Isle Knitting, and I ordered the yarn. Genuine Shetland yarn—Jamieson and Smith jumper weight yarn. I cannot wait to try knitting Fair Isle with Shetland yarn. 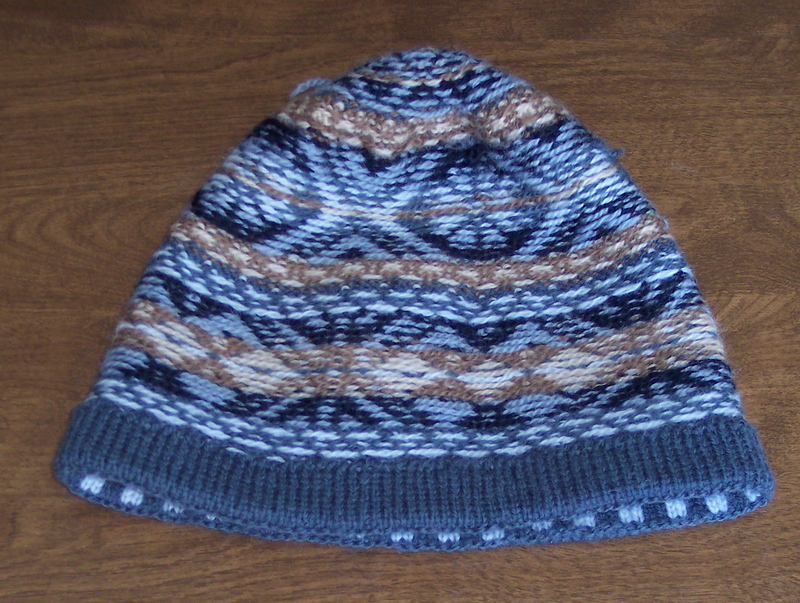 I used Jaggerspun Maine Line for my Fair Isle Workshop beanie, and it worked up very nicely. The yarn is pretty sticky, which is good for Fair Isle knitting, and it comes in a lot of colors—I used colors I had in my stash left over from another project—and it is very reasonably priced. It’s a good alternative to Jamieson and Smith’s or Jamieson’s Spindrift if you are on a very tight budget, but it isn’t Shetland wool.